In case you missed the May EACE Update we wanted to make sure you saw the exciting and innovative programs your fellow EACE members are up to. Join us in congratulating the 2016 EACE Award Winners. Make sure to register for the conference and attend the Awards Luncheon where the winners will be recognized and presented with a plaque. Until then a shout-out on your favorite social media platform using #EACE will suffice! I couldn’t believe I had received an EACE Professional Development Grant to attend the 2015 Annual Conference; I was so excited about the opportunity and knew it would mean great things for myself and my institution. I started the conference by attending the Newcomers breakfast and was able to network with newcomers from all over the East coast. We chatted about our different experiences in Career Services and enthusiasm about EACE. At my table was a board member who shared her experiences with EACE and encouraged us to become involved. She had signed up for two committees her first year and increased her involvement each year after that. She shared with us many stories about her fellow EACE colleagues who were now a valuable resource for her both personally and professionally. I could not wait to learn more about EACE so I signed up for the Public Relations Committee myself. I hoped it would help me with my state’s ACE marketing committee and enhance my marketing knowledge about Career Services. I was also impressed with the employers that I met at EACE. I was able to learn about internships that were available to my students and discover new companies altogether. I relayed all of that information to the Director of Career Services at Virginia Union University (VUU) who was much appreciative and the Internship Manager at VUU began contacting people right away. The Exhibitor connections were easily made as well; I gathered information on the different vendors and made suggestions to our director about what systems would enhance the Career Services experience for our students. We are in the process of reviewing all of the information and hope to make some changes soon. The programming was fantastic. I walked away with an enormous amount of useful information that I plan to implement in Career Services. I particularly enjoyed the Networking Styles presentation and felt that something like that could be easily added to our Career Services programming. Students often seem intimidated by networking and this presentation listed specific concrete ways to network effectively. I thought it would be useful for myself and the students I work with. I also enjoyed the speed learning sessions on Friday morning. The job shadowing model established at University of Pittsburgh seemed like a good idea for our office to follow. There were so many other fabulous presentations and sessions; I can’t possibly mention them all here. But it has been great being able to access all of the presentations on the EACE Conference app; that made my job even easier and I have been able to follow up with presenters as well. I enjoyed networking with other professionals from all over the East Coast. I had a fabulous dinner on the Duquesne Incline that gave us a beautiful view of the city of Pittsburgh overlooking three spectacular rivers. I met people from Virginia, Maryland and Massachusetts to name a few. We had drinks atop a rooftop bar and I donated to the Boys and Girls Club; what a great cause for EACE! I think they raised almost $4000 for the organization. I liked making new connections and looked forward to seeing colleagues again at future EACE conferences and events. The EACE Annual Conference: What was your favorite part? We would love to hear about your experience at the 2015 EACE Annual Conference. How great was Pittsburgh? Share your thoughts below in the comments box! There are experiences in our lives that sometimes pay rewards, in unexpected ways long after the initial experience has ended. Such was the case, recently, when EACE Community Service Co-Chair Beverly Lorig approached several former EACE Presidents with the idea of the “President’s Challenge…Commitment To The Future.” The idea of the challenge was to get all former EACE presidents to contribute to a campaign to raise $2,000 for the Boys and Girls Club of Western, PA. The initiative builds upon an EACE tradition of supporting a charitable effort or organization in the community where the annual conference is held. Past efforts have supported Veterans Employment in Portland, Maine, Habitat For Humanity in Atlantic City, and the Boys and Girls Club of Annapolis. The Annual Conference Registration Deadline is Approaching.. 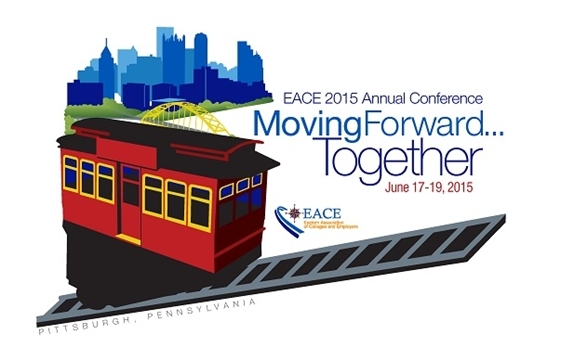 The 2015 EACE Annual Conference will be held Jun. 17-19 at the Marriott Pittsburgh City Center in Pittsburgh, Pennsylvania. Click here to view the registration fees. Space is limited; don’t wait! The EACE Annual Conference committee and headquarters are working very hard to deliver an exciting program of events this year. Don’t miss this opportunity to network with career service and HR professionals and exhibitors from around the entire East Coast while attending a variety of sessions that are NBCC and HRCI approved. The Eastern Association of Colleges and Employers (EACE) is proud to now offer a professional development grant to our membership. Moving forward the board will offer up to a total of $2,500 annually to help defray professional development costs for members who would not otherwise be able to participate. Grant monies are to be used toward EACE professional development opportunities, such as the Annual Conference, webinars, and Professional Development events. Applications for professional development grants are accepted on a rolling basis while funding is still available. All applications will be reviewed by the EACE Past-President and a recommendation will be made to the EACE board for final approval of grant money. Notification of awards will be given within 4-6 weeks of submittal. Complete the EACE Grant online application. Following the event, the recipient is required to write a blog post that includes information both about the event and the impact of being a grant recipient. This post should be completed and submitted to the EACE Past-President and Bridges Co-Chairs within 1 month of the event covered by the EACE Grant.